On Sunday, Radio Alice 97.3FM put on a concert open to the public for free. 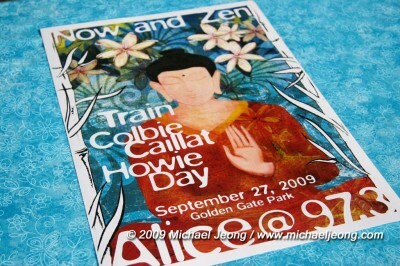 This is the very first time that Alice hosted a free Now and Zen Concert. The Alice Summerthing Concert earlier in the summer is normally free, but having another free concert brought to you by Alice is just simply amazing. Featured music artists were Train, Colbie Caillat, Howie Day, and Dashboard Confessional. People in record numbers crowded Sharon Meadows with thousands of people on the field as well as hundreds of people sitting on the grassy knoll in the back. Sharon Meadows is located toward the eastern end of Golden Gate Park and just right before the Panhandle Park. Various food and merchandise booths lined the entrance way before people proceeded to the main concourse. This year I was able to attend just the performance by Train and a performance it was. Lead singer Patrick Monahan riled up the crowd with his charm and some pretty amazing songs. He energized the crowd by singing his number one hits as well as grabbing cameras from the audience to take pictures of himself and the audience. He even came down to audience level to just sing to the crowd and to be embraced by his fans. His song set consisted of 16 songs. They were “You Already Know”, “Meet Virginia”, “Get To Me”, “She’s On Fire”, “Ordinary”, “Ramble On”, “San Fran”, “I Got You”, “Calling All Angels”, “Cab”, “Save The Day”, “Hey, Soul Sister”, “Free”, “Drops of Jupiter”, and “Dream On”. Alice has yet again impressed me with an amazing line up and I hope that it doesn’t stop there. I can’t wait for another year of great music, fun in the sun, and the possibility in meeting new people. Pictures of the Now and Zen Concert can be seen by clicking on the picture link above. Feel free to leave comments below for the pictures and the posting.